Canelo Casas, Nitro, Sangre Azteca beat Metatrón, Oro Jr., Star Jr.
Último Guerrero and Mistico feuded, UG getting away with a fairly blatant mask pull to win. This set up a singles match for next week. The opener is Retro’s streaming debut, though he’s another one of those guys who’ve been on the fringes since last spring before disappearing for a while. The lightning match is a big move fight, Drone going for the dives early and Puma stopping him, until he finally gets them and Puma has to go at that level too. It’s a swiftly moving match, maybe too much at times – not a lot of stuff has as much as impact as it should because they’ve got to get on to the next thing. (The ten minute limit forces the pace, but sometimes it’d be much better if they could go 12 when they need to go 12.) It’s also maybe a little rapidly back and forth than it needs to be, when the impact of those moves could’ve added up a bit if someone was able to get in a few in a row. Still, it’s a lot of fun stuff in a short spurt of time, and I like that Drone is using the moonsault instead of the low impact double knees as his finish. Fiero looks agile, is able to do a few spots that wows people even in the context of a limited opener. He’s going to have to escape these matches to go anywhere, but there’s some hope there. Retro is much bigger than I realized, noticeably a head taller than everyone else in this match. He moves awkwardly and didn’t show much except a lot of one foot dropkicks. He looks like he hasn’t had many matches, but spent a lot of time arguing with the referee. He didn’t show much of the classic style they’re going for. Eterno has been in IWRG forever but a big win for him is pretty rare. CMLL’s heavyweight championship has only changed hands in the ring about 14 times. Tonight might be the 15th. Marco Corleone puts up the title for the third time against Diamante Azul. Azul is a part timer, a luchador who hasn’t progressed much in years, and Marco losing the heavyweight title after about 10 weeks would be a much shorter title reign usual for CMLL. However, CMLL still is way behind at an uncommon level for a part time wrestler, and the rules that appear to apply to most people don’t seem to apply to him. Diamante Azul would’ve been the favorite to win this championship when it was vacant a few months ago had he been around, he’s probably going to win this championship at some point if he sticks around, and a title change could build up more interest in the Gran Prix. So could Marco doing something slightly rudo-ish to retain. Juice Robinson & Matt Taven team with Volador in the semimain, facing Euforia, Gran Guerrero and Rush. Fuego, the suddenly everpresent Johnny Idol and Stigma face Dragon Rojo, Polvora and Hechicero in the best looking match of the night. The two opening matches are heavy on local luchadors, with Astro & Asturiano making an appearance in the opener. As usual, the show will air at 9pm on CMLL’s YouTube channel. The brown area seem to have only a handful of tickets left. 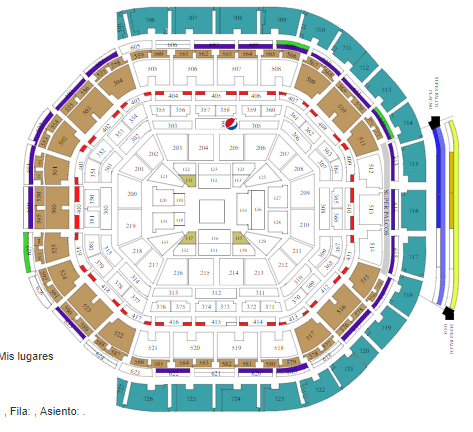 The blue areas have lots of spaces full, but those are the cheapest seats in the building; the big and medium money tickets are already gone. Flyer & Volador beat Freelance & Bandido in the main event of Saturday’s Kamicazes del Ring show. 5) Alas de Acero, Hijo Del Bombero, Kanon vs Acero, Súper Brazo Jr., Warrior Jr.
Hey, a Wednesday show again. Main event is a rematch from June 21, where the IWRG team beat the luchadors from Arena 23 de Junio. Diamante Azul fought as a rudo, but cleanly beat Marco in two straight falls to set up a title match next week. Gran Guerrero fouled Niebla Roja quickly in their final exchange as part of their usual feuding. Morphosis’ again wrestlers in his mask, the one he lost. The rudos jump the técnicos, so there’s not much time before the match for him to remove it. It finally settles down before the third fall, and the commissioner stops the match to insist he unmask then. Morphosis does his best to ignore the commissioner and isn’t going to unmask until Tirantes stops him from fighting on. (Notably, Morphosis’ mask is laced all the way up – he was never planning on just wearing it for his entrance and taking it off, he wasn’t planning on removing it so it take some time for him to get it off.) The announcers suddenly remember Morphosis is supposed to be unmasked when the commissioner gets involved. This appears to be his last match in CMLL, as he was officially announced as appearing on TripleMania a few days later and had been said to be appearing there for a while. Despite that, in probably their last match as a trio (since only Olímpico & Kraneo are left) in the arena they debuted in, Los Invasors win the match without getting beat. They’re disqualified for a planned excessive DQ in the second fall, and Blue Panther & Morphosis have a double pin in the third fall. Kraneo beats Soberano in the first, and Olímpico finishes with a win on The Panther in the third. Disturbio and Paris are seconds, though they both take a moment to turn up. Zeuxis grabs a bottle from a fan at one point in the third fall to swing at Sugehit. It does not connect, and Sugehit gets it herself – but doesn’t swing because she doesn’t want to be disqualified in a the title match. Zeuxis uses something resembling Puma’s submission hold to win the first match; it isn’t exactly it, but it’s along those lines. The fourth match is an energetic and long match between two usual teams. The técnicos, especially Soberano and T. Panther, work fast and kept the match from dragging down to a slower pace like might be expected with the Invasors. Kraneo took his usual big of big bumps and destroyed Soberano well. The third fall kept going, but in an interesting way, and this had more life than most matches o this show. This just crossed the line of good for me. Sugehit/Zeuxis was a good title match and worth watching, but I kind of wonder if this feud peaked a while back and they’re kind of going too long. This was worked a different way, and they’re trying different things to make it seem fresh, but they’ve been at this feud for so long that it’s really tough to make this feel special. I think it’ll still be good match on 09/16, because the stakes and because most people will not have watched all the months of lead up, but nothing’s really happened here since the title change and it’s hard to get past that. Maybe it’s just because the “should this be in the main event?” discussion was in my mind watching this; this match didn’t feel like an Anniversary main event or even necessarily a breakthru women’s match, but a well worked midcard feud. All that said, the bottle bit killed me, the finish was pretty good, and this was an upper level match for a b-show title defense.